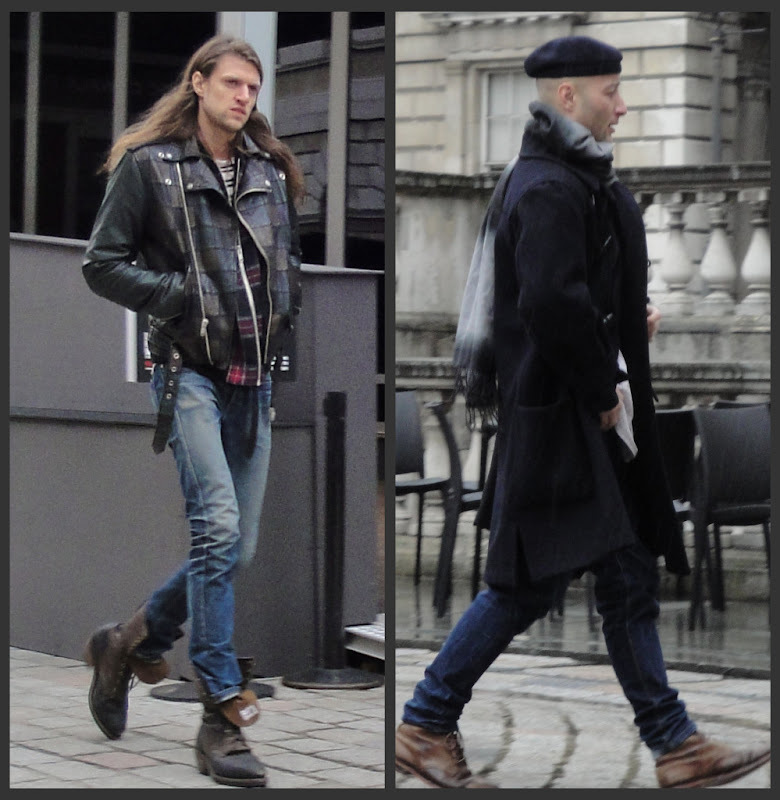 while girls tend to get the bulk of the attention at london fashion week (after all there is only 1 day devoted to menswear) there certainly are a lot of fashionable men trotting around. there are those who are trying to make a statement (i am sure you have seen a few on here already) and then there are those who look so blatantly unconcerned with the faff of it all. i got this feeling most strongly from the gentlemen pictured above. they just look so cool and so nonchalant about the whole thing. i love it... and seriously, can i borrow that black and white check shirt please? these two guys are rocking totally different looks - but one thing key thing that they both have? perfectly worn in brown leather boots. some more cool kids... totally love the fact that this guy in the white fedora is wearing a white fedora. hats in general were pretty rare which i found a bit surprising. kudos to him for wearing a summer hat with sunglasses on a seriously miserable and rainy day (i definitely feel like doing that sometimes.. dressing how i feel regardless of how ridiculously inappropriate it may be - i.e. my constantly nagging need for bare legs despite the fact that it is still dipping below freezing at night... boo england why must you crush my every desire?). anyway, basically all these boys are just oozing a sort of 'not really bothered' vibe which i totally adore, and i can't help but think it is remarkably refreshing when so many of the men at fashion week looked a wee bit on the extravagant side... welcome back boys, i like your laid back style.